← Working on a Book. While this is the aspect that I find most interesting when walking in the Salt River National Park, it is not what the National Park Service was looking for. They wanted to know my interpretation of the historical significance of the area as it relates to the people who occupied the land. The more I read, the more I recognized how shallow our knowledge of the people who lived at Salt River really is and how much was actually false and based on published “Romantic Histories” which dealt loosely in facts and are passed on to our children by experts in the National Park System and teachers in our schools. The romantic history of Columbus by Washington Irving was quoted and further romanticized by Florence Lewisohn in her very short book the “Divers Information on The Romantic History of St. Croix From the Time of Columbus until Today (1964). Obviously the book is dated but it is likely to live on in immortality as it is quoted by many scholars and is the foundation document for the historical significance of Judith’s Fancy and the Salt River National Park. According to the brochure for the Salt River National Park, the men of Columbus were looking for water on November 14, 1493, and “encountered several Caribs in a canoe. They fought and each side suffered a fatality in this first documented armed resistance to European encroachment in the Americas.” The Spanish captured several Caribs and left St. Croix. Allegedly after the battle, Columbus named this location the “Cape of the Arrows because of the large number of Arrows launched by the Indians.”Within a generation (1512), the Caribs were ordered exterminated by the Spanish Crown, or to be captured and sold as slaves. Following that disease depopulated the island by 1590. 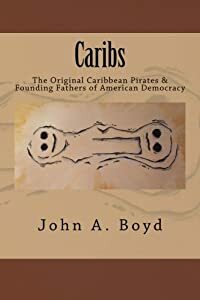 As I point out in my just published book, “Caribs:The Original Caribbean Pirates & Founding Fathers of American Democracy” (Kindle Edition) (Paperback Edition),” the battle at La Navidad was not the first armed conflict between the Amerindians and the Conquistadors. In Samana, D.R., on January 13, 1493, during his First Voyage, Columbus battled the primitive Ciguayos who did not speak the same language as the Arawaks he had already captured to be interpreters. While attempting to trade with them and perhaps capture an additional 10-25 to return to Spain, the Indians turned hostile and confronted him with his only violent resistance on that first voyage being armed with bow and arrows. He called the inlet where he met them the Bay of Arrows (or Gulf of Arrows). This was recorded in the Diary of Columbus’ First Voyage and obviously this is the reference hijacked by Lewisohn in her Romantic History of St. Croix. No other observer or Historian makes reference to the Cape of Arrows at Salt River prior to her book. During that encounter at Samana, Columbus crew killed two Ciguayos and the victims and their tribal group were described in his log as “evil, and I believe they are from the island of Caribe, and that they eat men.” From this humble start, Peter Margarita could pass the time on the long second voyage telling stories on the cannibals encountered on the first Voyage. The Ciguayos had no relationship to the Caribs as the Caribs spoke an Arawak Language and the more primitive Ciguayos did not. Also the Caribs used poison on their arrows; the Ciguayos did not. One more minor issues with the National Park Service brochure is that it is improbable they were looking for water as they had traveled 21 days across the Atlantic with the water they could carry and filled up on water in Guadalupe four days earlier. All of the early witnesses also mention that Columbus wanted to meet and talk with the Caribs and learn their customs. The well armed boat of Conquistadors sent into Salt River lay in ambush for the unsuspecting Caribs for the better part of a day before attacking the distracted Caribs who were observing Columbus’ fleet. 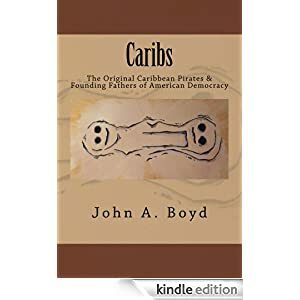 Finally, the early Spanish Documents until 1547, make specific mention of the attacks on Puerto Rico by the Caribs of St. Croix so for 55 years, the Caribs had not abandoned the island or died from disease, nor did they retreat to another location further away. The Amerindian resistance of the Spanish by the Caribs should be recognized and this makes the island of St. Croix a significant historic location worthy of recognition but no specific information ties this 55 year of continuous raids to Salt River other than the one battle between the Amerindians and Conquistadors on November 14, 1493. This entry was posted in Judith (Soldier) Hill, Judith's Hill, Salt River, Uncategorized and tagged Caribs, Columbus, hiking, Kalinago, Native American, nature, outdoors, Pirates, salt river bay, St. Croix Hiking, St. Croix History, St. Croix Plants, St. Croix Vacation, walking. Bookmark the permalink. I am currently awaiting proof copies of the paperback which is a little harder to change than the ebook. Soon Come!!! Well, the Internet is both a hughe waste of time and a fantastic resource and for some people like me it is both. Go give your parents a hug and explain that you are both right. BTW, pick a topic go to Google.com and Archive.org and research the old books and you can become the world expert on whatever you choose. Have fun!